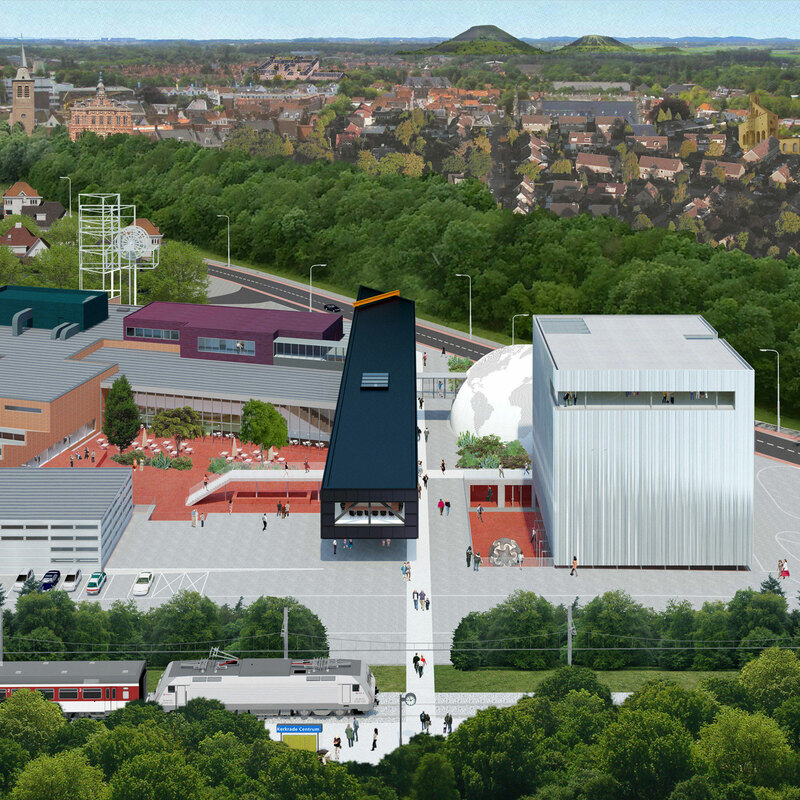 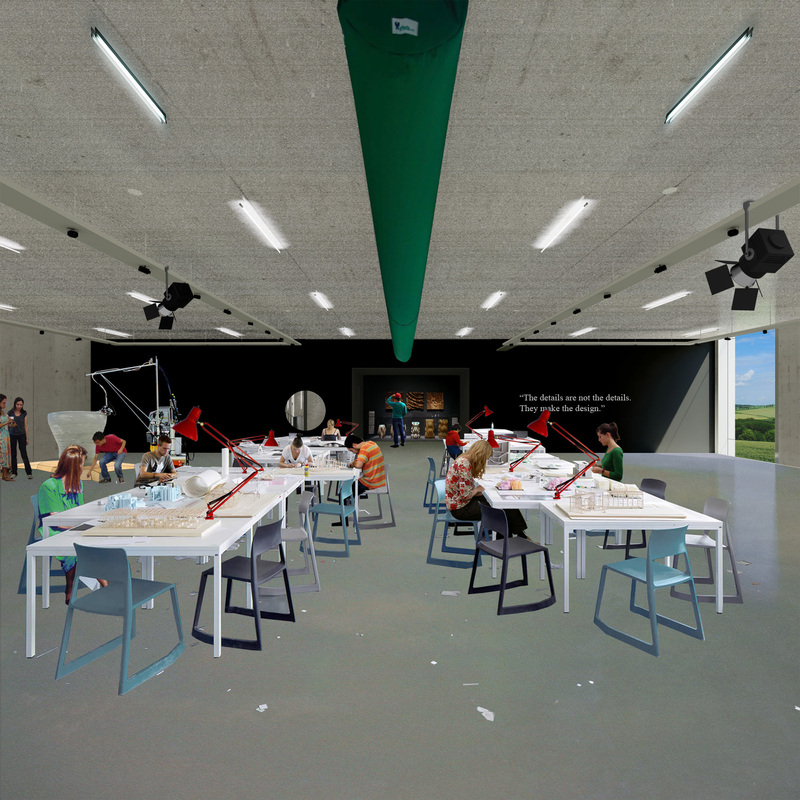 Museumplein Limburg is a trinity of complimentary museums combining design, science and technology in one museum district in Kerkrade, a town at the Dutch-German border. 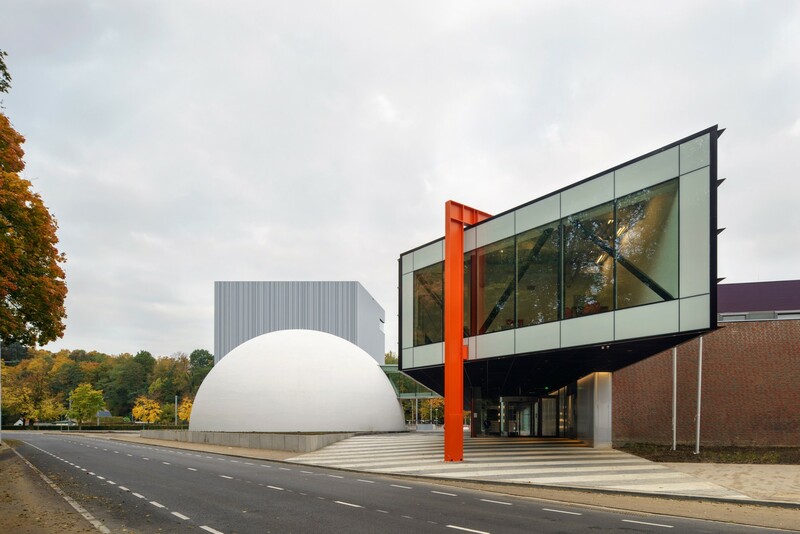 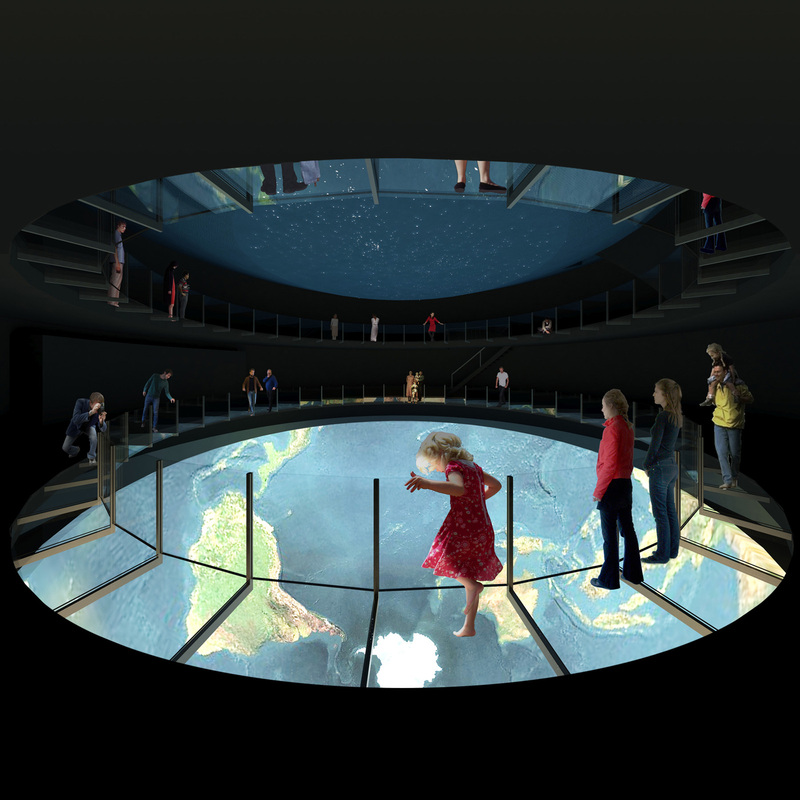 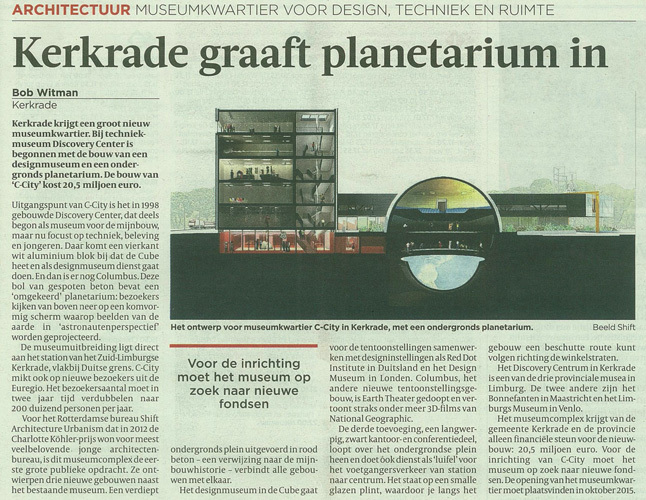 The existing Continium (a discovery centre for science), has been extended with Cube (a design museum consisting of exhibitions and exploratory labs) and Columbus (housing a unique Earth Theatre and a 3D cinema), as well as a wide range of public facilities for events, workshops and education. 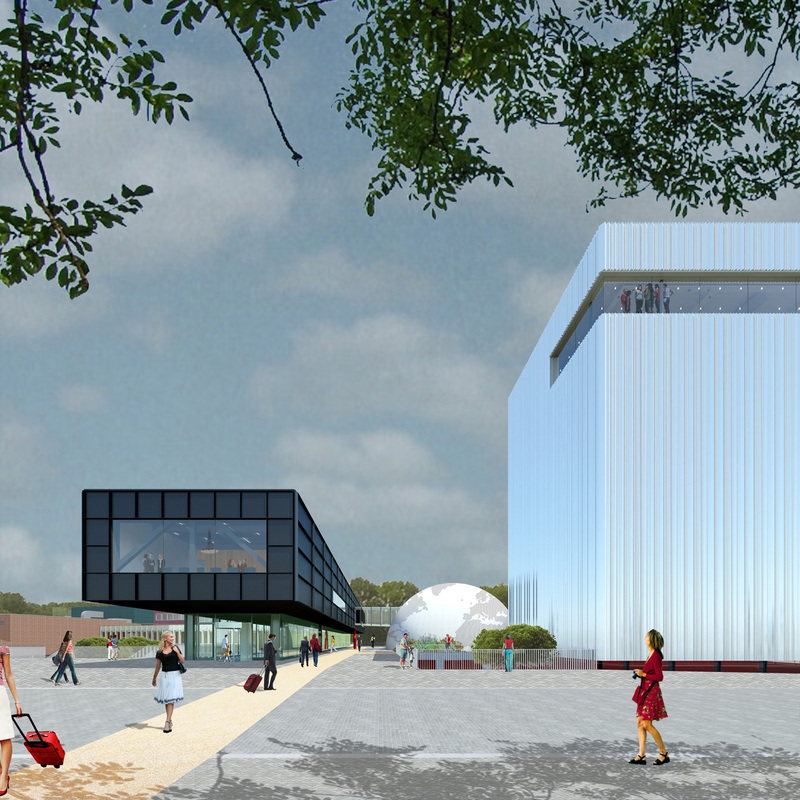 Capitalizing on the strategic location, the museum quarter formalizes the entrance into Kerkrade for both train passengers and visitors arriving by car from the main access road. 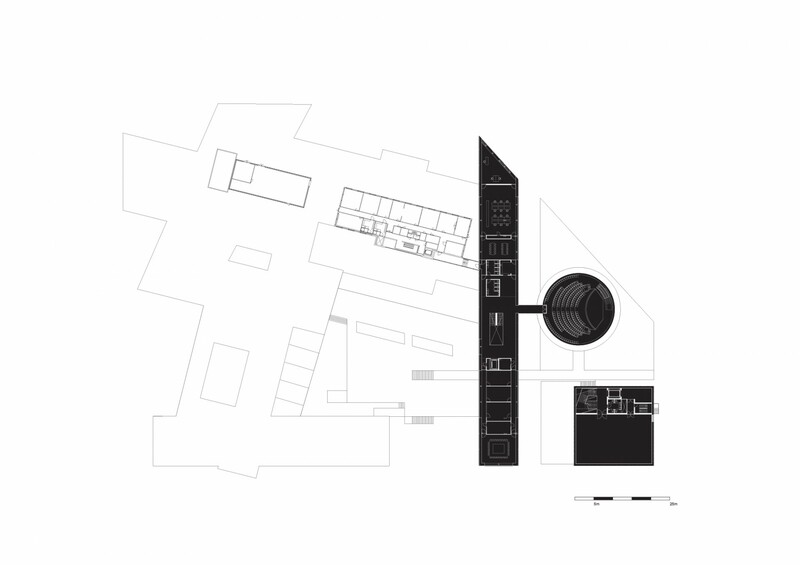 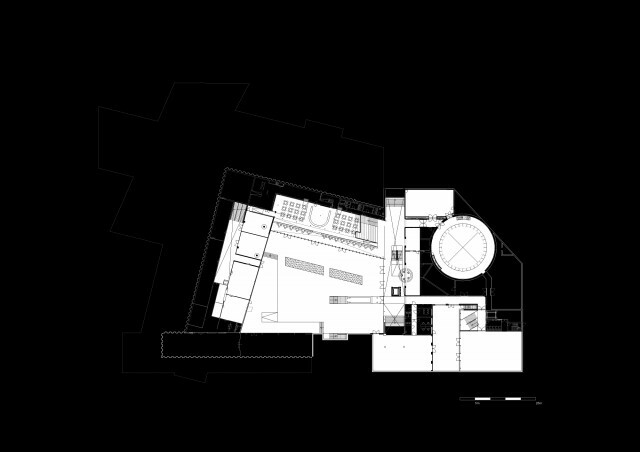 The brief required the extension of the existing museum with two new institutions, each with an own identity, but which can also function as a whole. Our answer is an ensemble of clearly recognizable volumes connected by an elaborate underground public space. 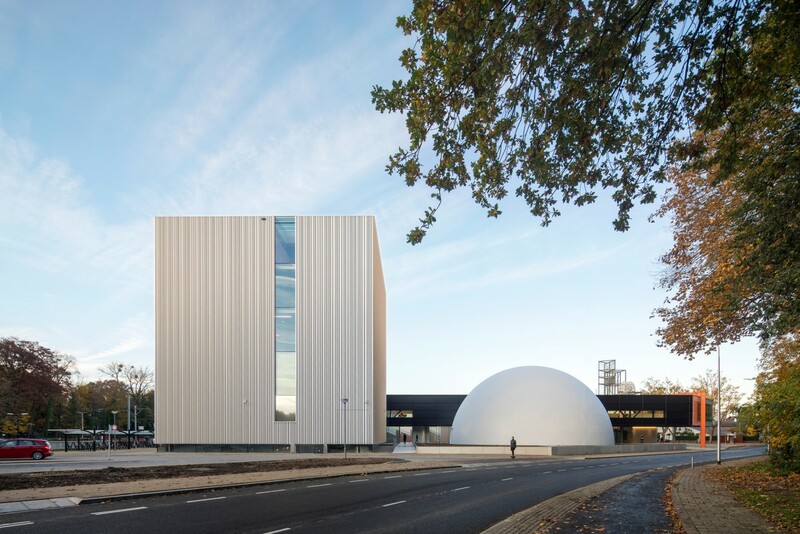 Above ground, a cube and a sphere, spectacular in their absoluteness, provide the two new institutions with distinct identity. With their pure geometry and omnidirectional orientation, the cube and the sphere counteract the amorphous and introvert character of the existing museum. 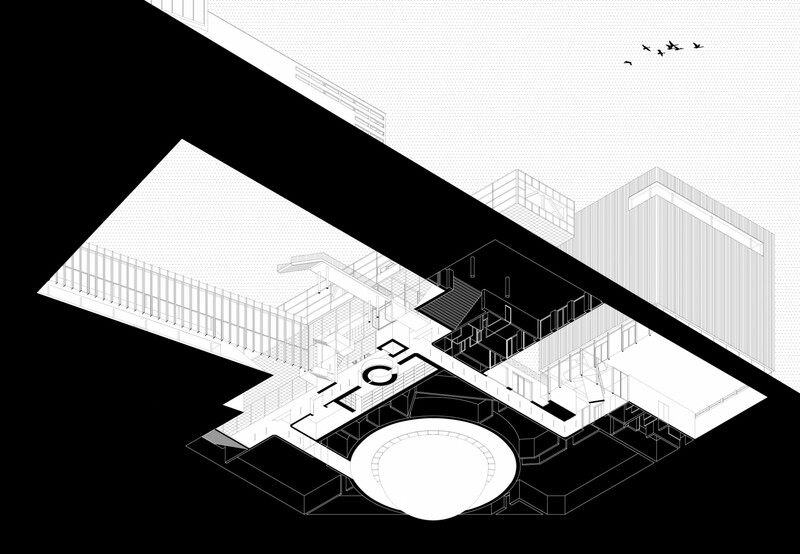 However, their iconic character doesn’t make them into isolated urban objects. 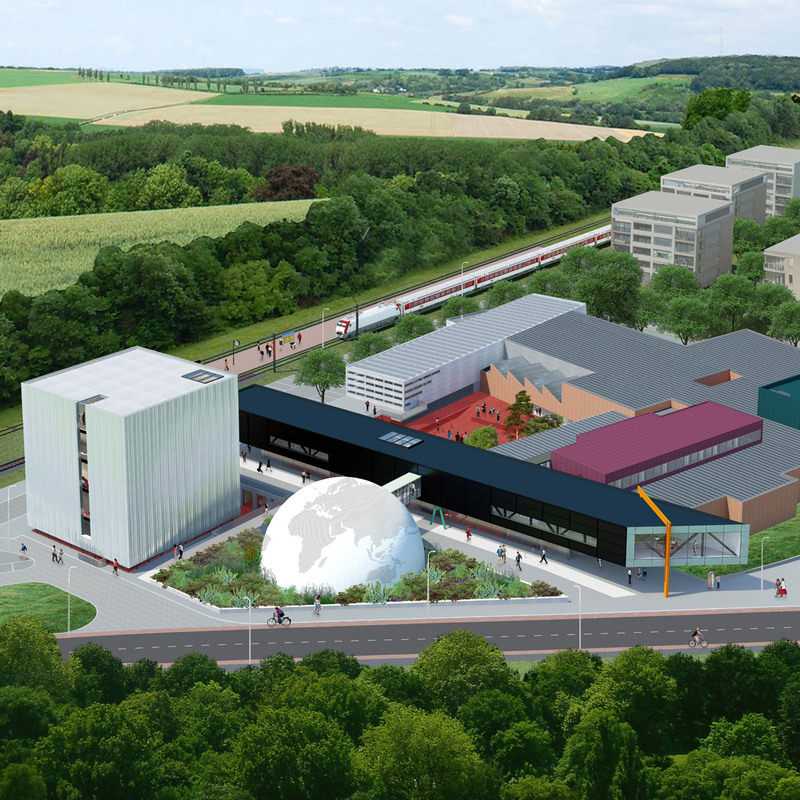 Together with another primary solid, the 80m long beam which doubles as a giant canopy, they are carefully placed in relation to the nearby station to articulate the public route between the station and the city centre. 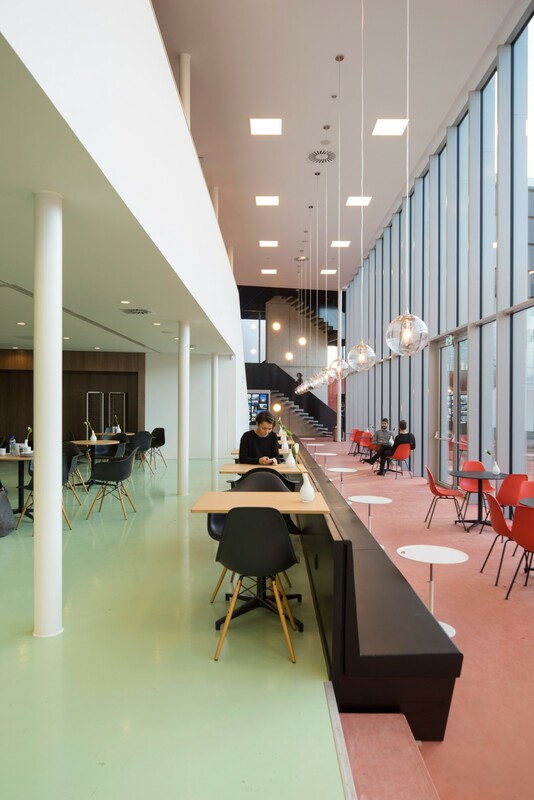 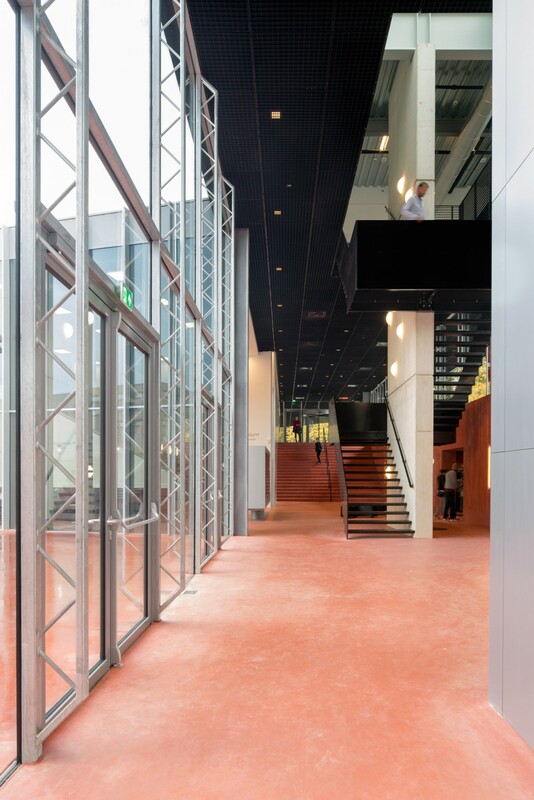 On this public walkway, the volumes reveal themselves towards the pedestrians with lively areas such as the entrance hall underneath the beam and the design labs underneath the cube. Underground, the sunken square, the best feature of the original museum, is extended underneath the new volumes. 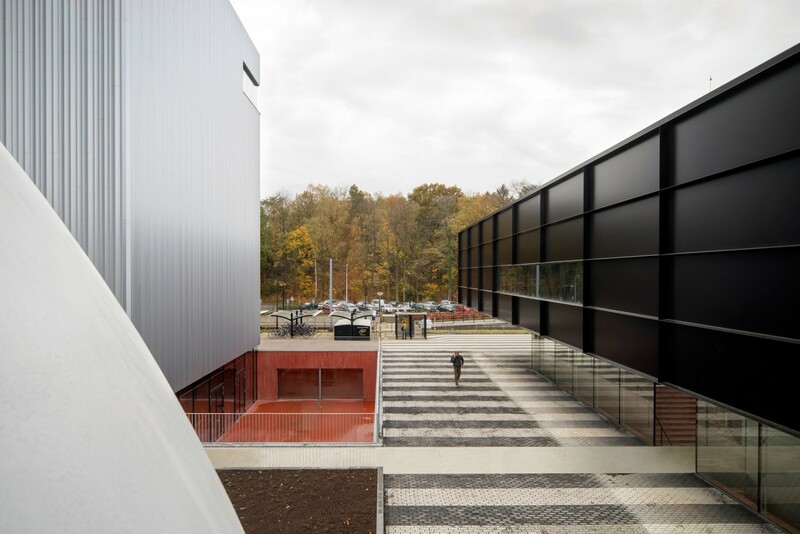 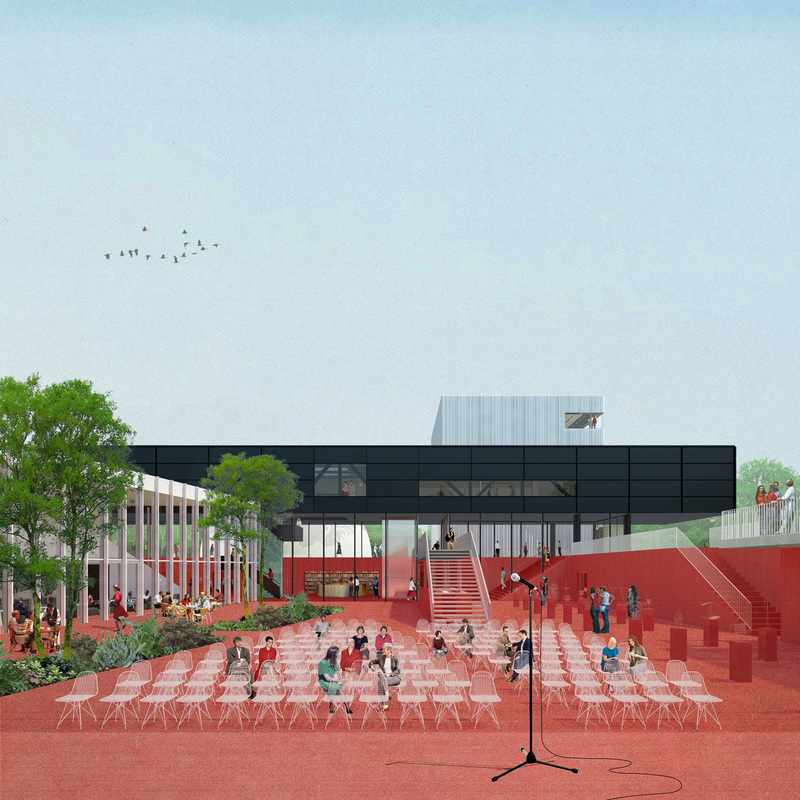 A continuous landscape is created that connects all the facilities of the museum district, both old and new, and allows them to function as a single whole. 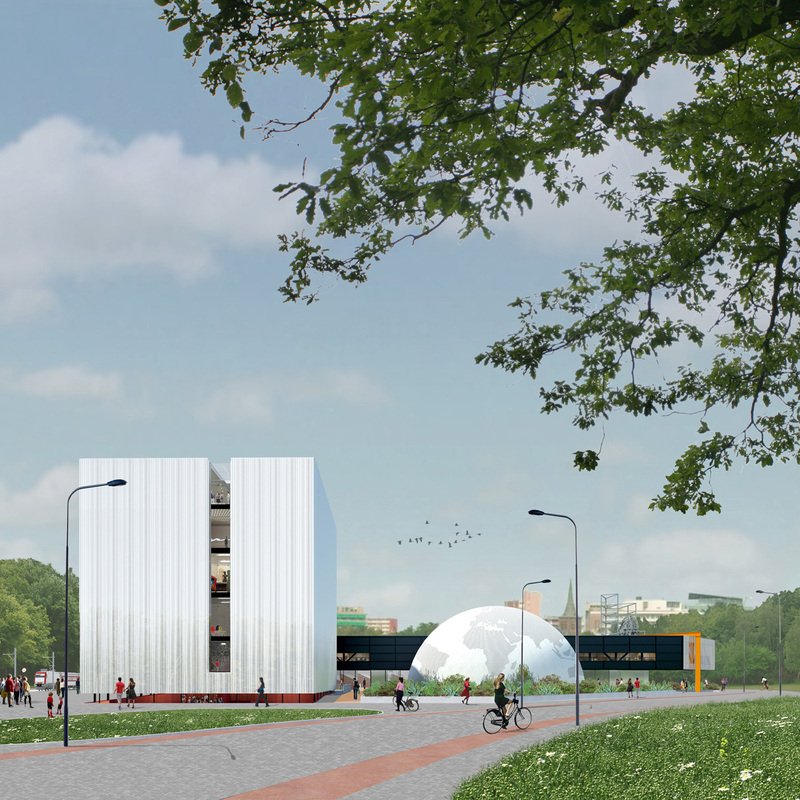 The new enlarged sunken square forms the heart of Museumplein Limburg. 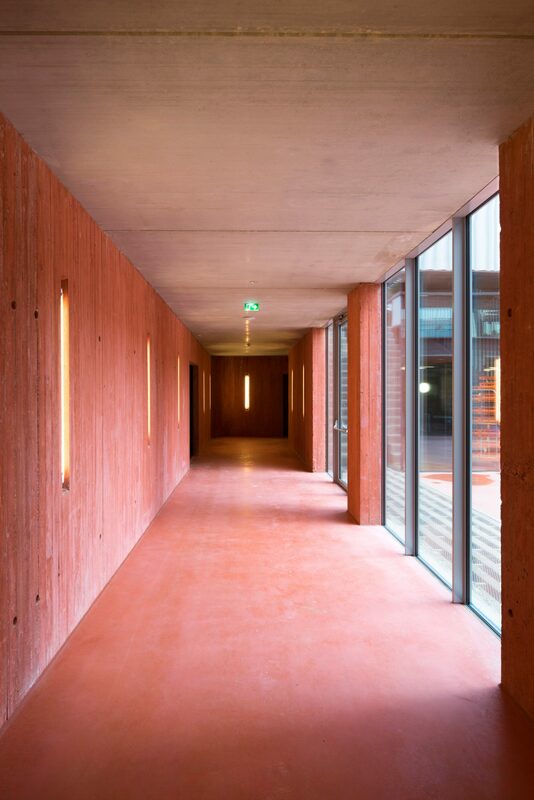 It extends seamlessly underneath the beam that hovers above the double height entrance hall. 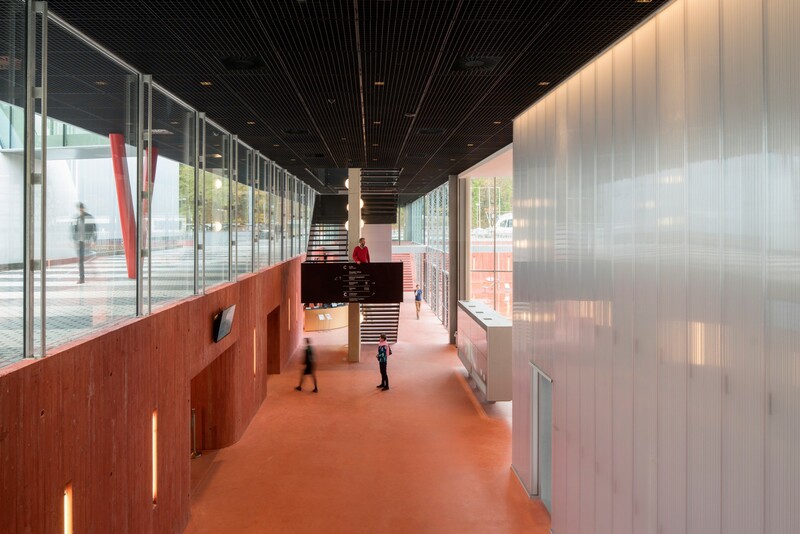 This linear entrance hall serves as the logistic backbone of the whole museum district. 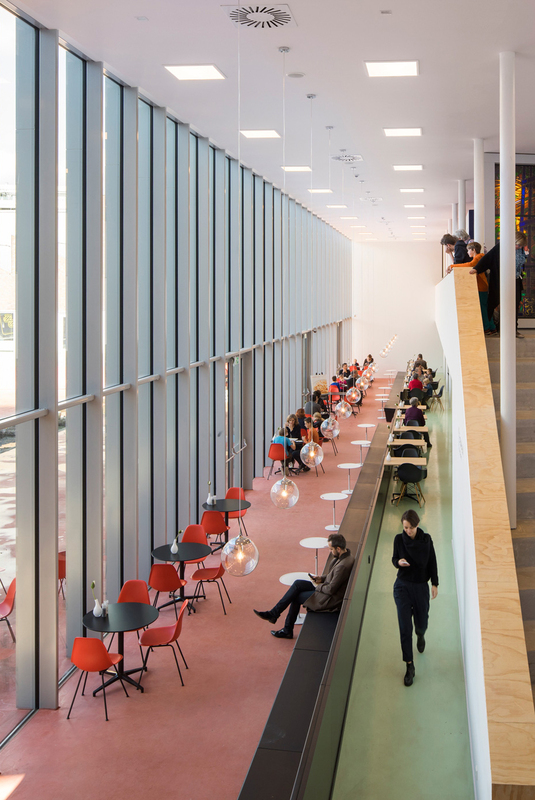 Visitors descent via one of two wide staircases at both ends: one orientated towards the train station and the other towards the town’s centre. 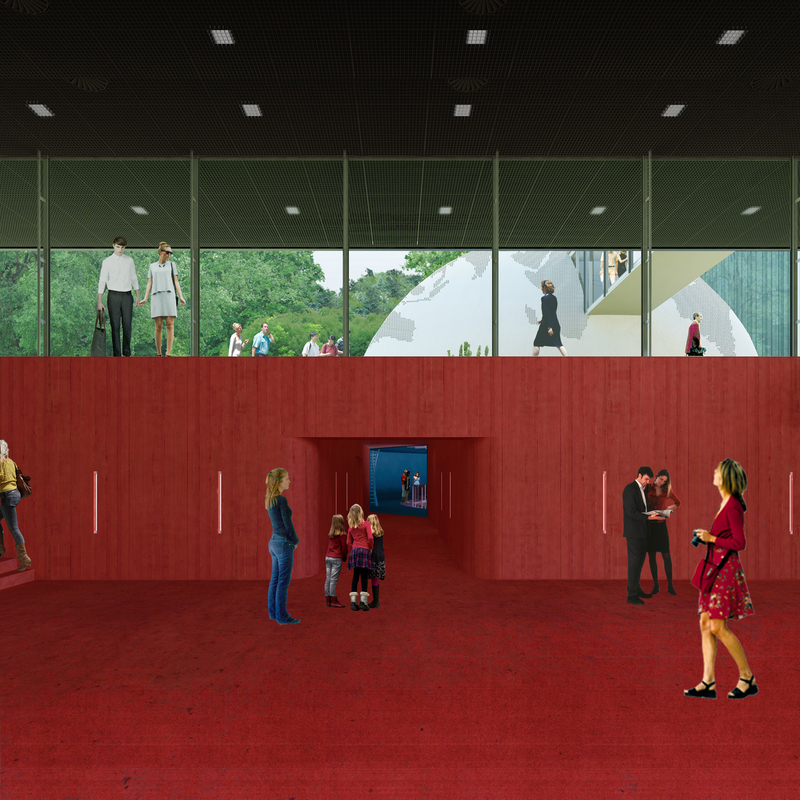 In addition to the new museum square and entrance hall, the underground landscape hosts a restaurant, an enclosed patio and two tunnels connecting to Cube and Columbus. 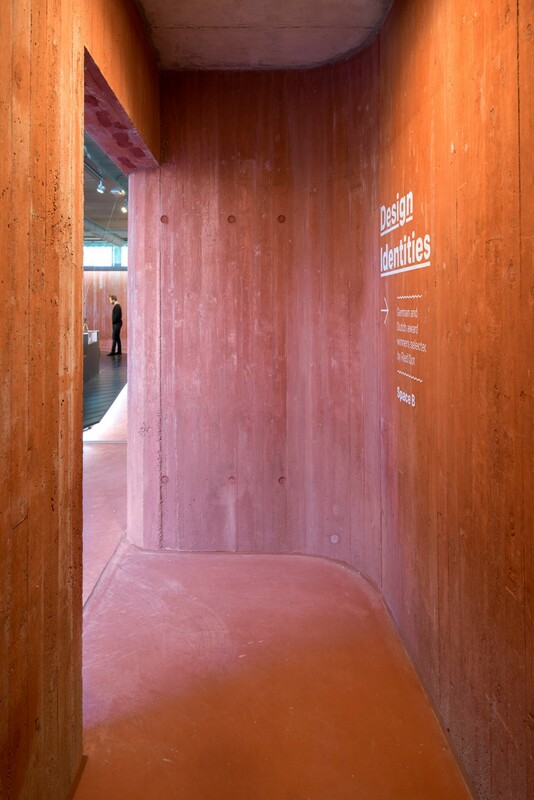 All stairs, walls and floors of the underground landscape are made of a uniform earth tone concrete to emphasize the connective character of the space and to create the suggestion of an excavation. 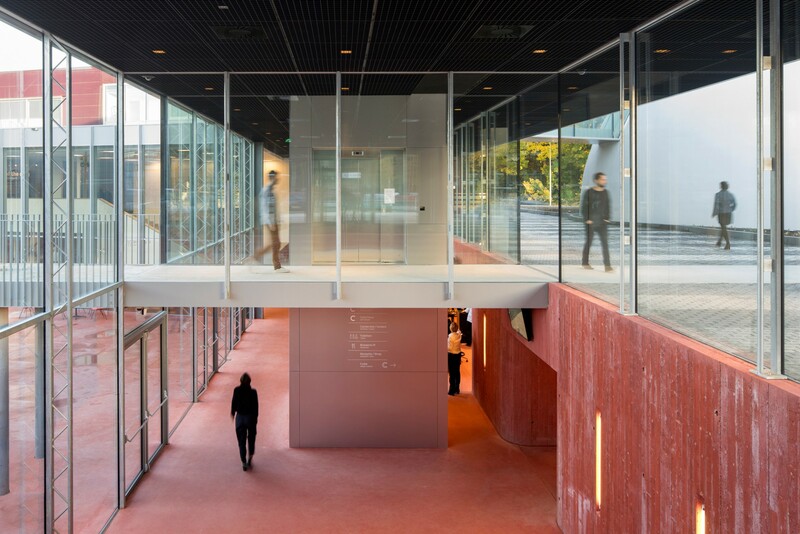 The walls were poured in a formwork of rough wooden planks adding a tactile quality that contrasts with the abstract volumes above ground. 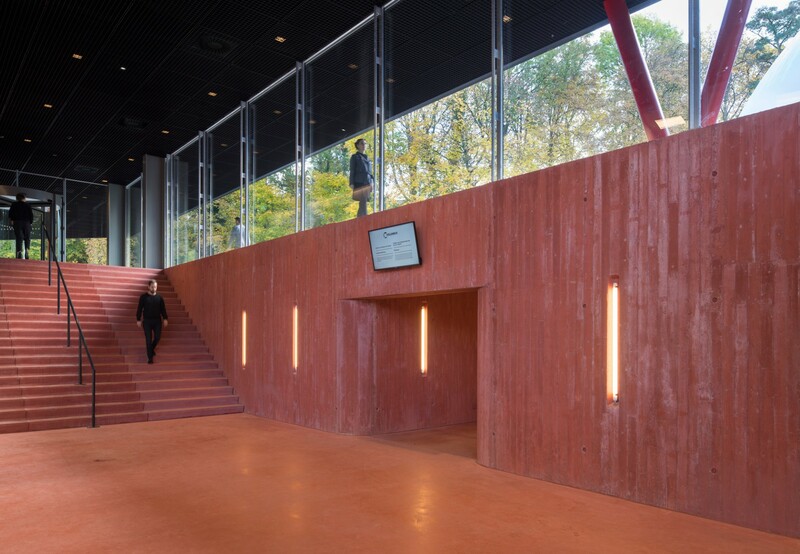 The excavation out of red concrete, combined with the experience of descending below ground, refer to the mining past of Kerkrade. 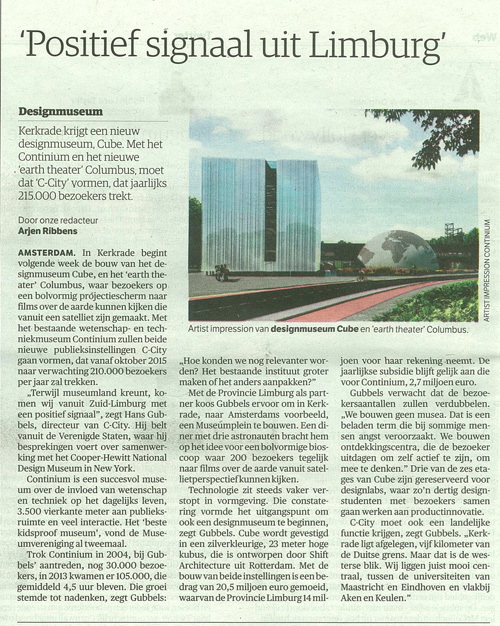 Our ambition was to translate this concept architecturally by blurring the boundaries between museum space and public space, and make Museumplein Limburg an integral part of Kerkrade. By situating a large portion of functions underground, the built footprint on the ground level was minimized, thus leaving space for public walkways to criss-cross the museum district. 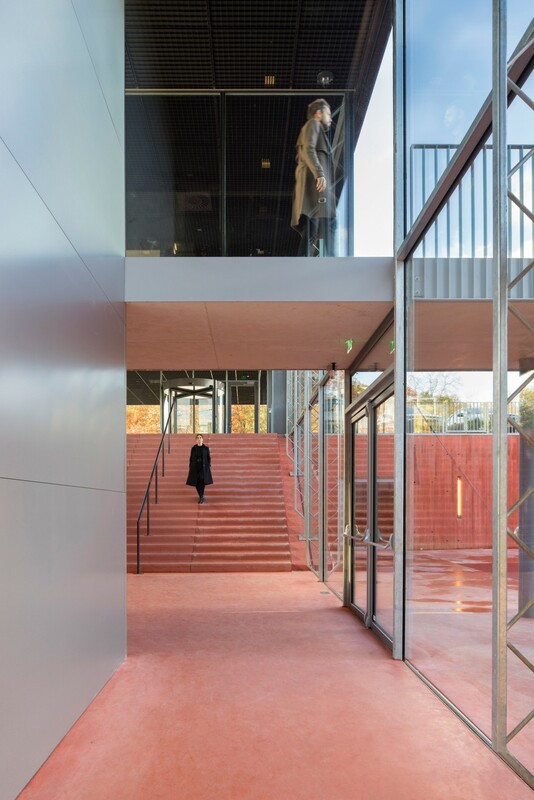 The route to and from the train station, designed as a scaled up zebra crossing, creates a visual dialogue between the museum district and station area and adds to the experience of both the museum visitor and the train passenger. 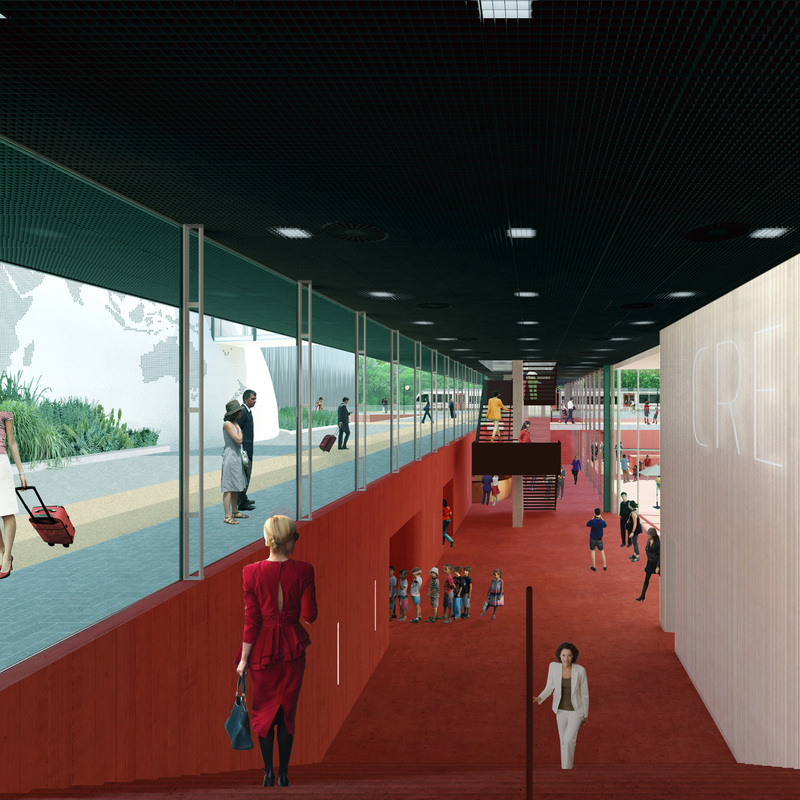 A transversal walkway, punching through the entrance hall, connects the sunken museum square to the district’s bus terminal in the forecourt. 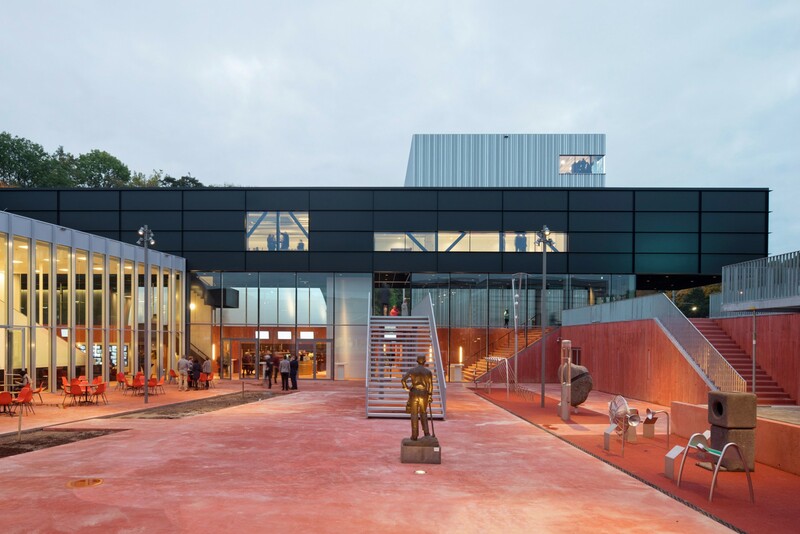 This walkway provides train and bus passengers direct access to the museum’s restaurant which can double as waiting room, transforming the museum square into a true extension of the public realm of Kerkrade. 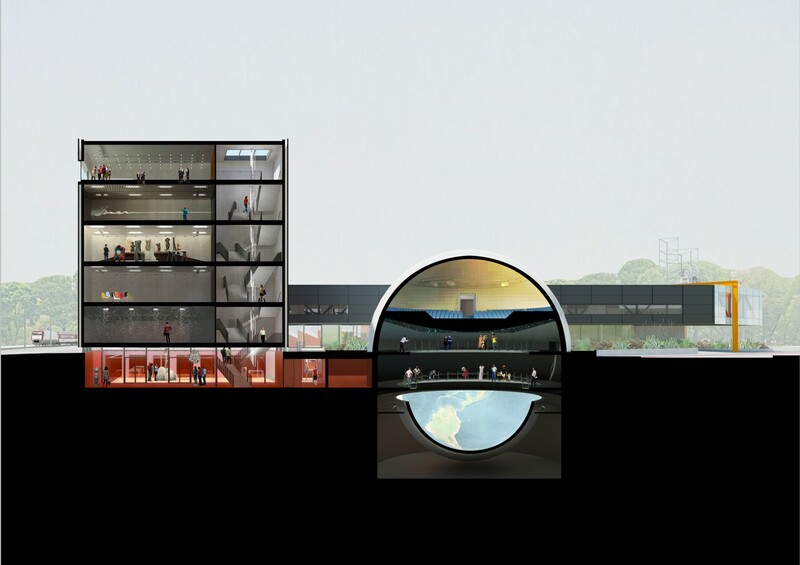 The combination of public space and public transport with the museum district fits perfectly with the ambition of a “museum without boundaries”: even passers-by become participants.